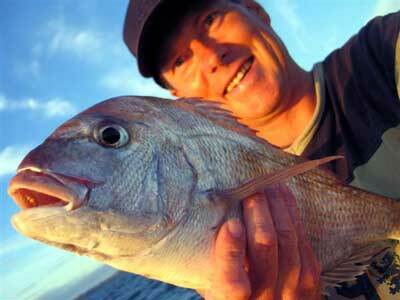 Snapper catches have been improving at Mokau. Many are being caught close to shore. Sunday February 5th I caught a 7.1 kg snapper and 6 others up to 3 kg plus six good sized gurnard. 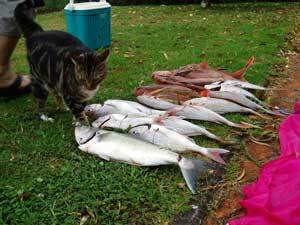 Kontiki fishers here have also been catching good fish. One in particular on the Saturday pulled in 16 fish from just one set. 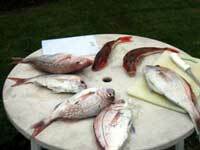 Caught these nice snapper and gurnard north of Rimmers Road on Saturday 5/2/2005. The wind was perfect and took the 25 hook longline out in record time. My partner and I did two sets returning a total of 11 snapper, seven gurnard one kahawai and three sharks that were let go. Max the cat was my new best friend. Bait was a mixture of bonito and mullet. The Manukau Harbour is still fishing well. On Tuesday I set one 25 hook longline twice (no floats on traces) and caught 15 snapper and five kahawai. Two of the snapper were good size and I also caught five good kahawai. On Thursday evening two of us shot onto the harbour for a fish and set two 25 hook longlines. One longline had the traces fitted with double floats and the other had no floats on the traces. This time, the one without floats came up empty. 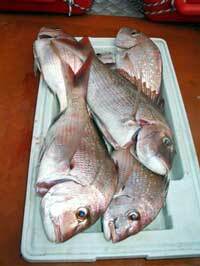 The floating traces however saved the day by producing eight reds including two about two kilograms each. Please excuse the self portrait above but it is so hard to get good crew! Couldn't resist a third trip this week. Friday morning I hooked the six fish in the photo on the right on ledger rigs snelled with target hooks about two minutes from the Weymouth Ramp. These small tides are great for our inner harbour snapper. On Sunday 6/05/05 my girlfriend and I headed to the 4WD access on Coast Rd, Muriwai at about 4pm. The tide was on its way in and the wind was heading straight off the beach - the conditions were perfect for kitefishing. It was my first time using my 65kg Dropper Rig, which I had purchased about 2 years ago and finally got round to trying it out. After a short time figuring out what we were doing, the gear was heading straight out off the beach. We only did the one set baited with blue mackerel, which I had purchased from Paul's shop - I highly recommend it! We set 10 hooks out to around 800 metres offshoreand left the gear out about 15 minutes for a catch of five good pan sized snapper and two gurnard. As I am not that experienced in the art of filleting fish, I was wondering if there was an easy way to go about filleting gurnard? 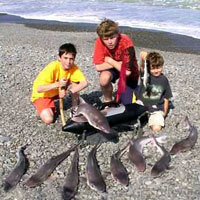 Back at Waihi beach early in January we had the best catch of gurnard that we have ever had. We managed a haul of 17 gurnard from 24 hooks set with the Kentiki. We set at 6.30 pm and used bonito fillets for bait and also had a burley pot clipped onto the line behind the first sinker. On the left is a photo of the burley pots we use. They are made from Surebake yeast bottles. I used Ultrabite Burley pellets. I drill 8mm holes in the bottles and the cap. I have a button connected to eight inches of nylon which goes through the lid. A sea harvester clip is tied to the other end for clipping the berley pot to the hook section of the longline. On other sets, using the burley pots on the front of the hook section and before the last sinker we have caught fish when others were finding the fishing was quite difficult. 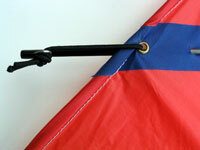 Are you sick of replacing perished rubber bands on your Flexiwing? A 185mm length of 3mm bungy cord tied as shown takes care of the problem. Cut the end of the cord with a hot iron which seals the rubber and stops the fabric from fraying. It may be neccessary to straighten the wire loops at the ends of the cross spars slightly to allow the new cord to slip in easily. It is a good idea to smooth the ends of these same wire loops with a small file, so that they don't catch in the fabric of the bungy cord. It was a nice day with flat surf and an onshore wind so we used the electric torpedo. The trip resulted in nine good sized school shark, one slightly smaller rig and a a few dogfish. 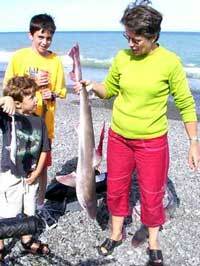 Pics are my mates kids posing with the torpedo and the school sharks and Mother and Son comparing sizes! I love using the spectra line with my flexiwing. 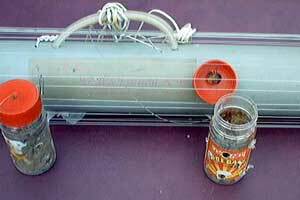 It has no stretch and stays out of the water a lot further than the old nylon did. It also makes retrieval a lot easier. We fished two 25 hook sets of our kite longline rig from the very top end of Muriwai in a light southwest wind on the 26/2/05. Both sets were baited with mullet and set straight out against the incoming tide. We caught a total of 13 snapper and a shark. After a recent harrowing experience where a 20 foot white pointer shark attacked my kayak while longline fishing at Taupo Bay around Christmas, I got up the guts to go out kayak longlining again. Last Saturday I kayak fished with Peter Vesaloto off Te Ari point. We had about a meter rolling swell and it was calm, it felt quite good once I was out there. Peter got seven good sized snapper up to 6lb and I got 12 good ones up to 9lb. AWESOME day, sorry we didn't take photos but I am doing it again tomorrow. On Sunday we were back out again, this time on the incoming tide. Bottom longlining with Peter Vesaloto off Te Ari point I laid five sets in a rather extreme chop on top of the swell - a wind strength of about 20 knots onshore.